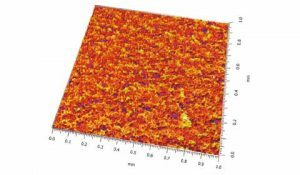 Optical profilers are very popular nowadays and frequently used to verify surface texture specifications on manufactured components. However, technical drawings are usually not made for such areal instruments and instead provide profile surface texture specifications. This can be confusing and may lead users to wonder how to compare profile and areal values. 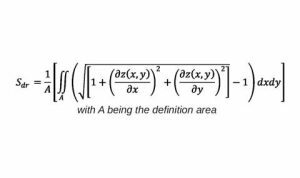 Even though the equation of Sa is the areal extrapolation of the equation of Ra (see below), this does not mean that values should not be compared directly. When a technical drawing contains a surface texture specification using Ra and a given tolerance limit, it is not possible to directly compare Sa values with the tolerance value given for Ra. A new tolerance value needs to be fixed for areal measurements and new specifications, adapted to Sa, need to be defined. The first reason for this relates to the analysis bandwidth. Ra, by definition, is calculated on a roughness profile, based on a profile filter which filters spatial frequencies along the X axis (by default a Gaussian filter with a cut-off of 0.8 mm). Moreover, it is evaluated on several sampling lengths (as per ISO 4288) and averaged (except when calculating Ra according to ASME B46.1 where only one value is calculated over the sampling length). 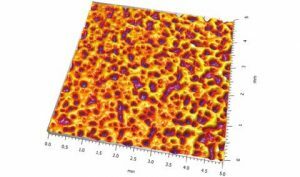 On the other hand, Sa is calculated on a S-L or S-F surface based on a 3D filter. The areal filter takes into account wavelengths in all directions which means that it generates a different effect from the profile filter. The difference is especially visible when the surface has directional structures such as scratches or directional tool marks or possesses periodical patterns. The second reason we need distinct specifications for Sa is to do with the size and resolution of the measured surface. When measuring a profile on a component, ISO 3274 defines the relationship between stylus tip, data spacing and evaluation length. A typical measurement is 5.6 mm long with a lateral resolution of 0.5 µm, which means 11,200 points. An areal measurement made with an optical profiler is usually smaller in lateral size (commonly between 1 and 2 mm). Its lateral resolution may be of the same order (1 µm) depending on the instrument lens. Larger areas may be obtained using small magnification objectives (although these are less well adapted to surface texture) or by stitching many surfaces together. A lateral scanning instrument, such as a 3D stylus profilometer or a chromatic confocal probe, makes it possible to scan a larger area and generate a surface several millimeters in size, but users frequently select larger spacing in Y (between lines) than spacing in X (between points) in order to reduce the scanning time. These differences in lateral resolution and scan size lead to differences in parameter values. The following examples show how results are different, yet close enough to create confusion. The comparison with profiles is obtained by extracting series of profiles along X or Y. A real profile measurement would usually be of a longer size and have better lateral resolution. Shot blasted aluminum, measured with a confocal microscope. The surface is almost isotropic. Gaussian filter with a cut-off of 0.25 mm. Grained plastic measured with a stylus profilometer. The surface has homogeneous texture cells. Gaussian filter with a cut-off of 0.8 mm. Structures on an ultrasound transducer, measured with a chromatic confocal probe. 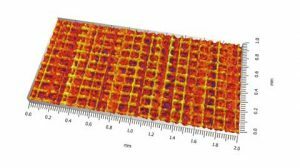 Areal parameters cannot be directly compared with specifications and tolerances of profile parameters. Distinct specifications need to be set for areal measurements and indicated as such on drawings. Recommended instrument technique may be indicated in order to avoid variations between specification and verification.